Lily's favorite movie was the Wizard of Oz. She watched it every single night before she went to bed. Sometimes her friends watched it with her. Other times they'd play and pretend they were characters in the movie. Lily always got to be Dorothy. "I love Dorothy. She's my favorite character. I think I'll ask my mum and dad for a pair of ruby slippers and a dog that I can name Toto." Lily giggled and ran into the living room. "Mum, Dad, can I have a dog?" Mum and Dad had a rule in their apartment building. No pets were allowed. "I'm sorry, Lily. You can't have a dog," her father said. "How about a goldfish?" "I don't want a goldfish. Dorothy doesn't have a goldfish. I want a dog so I can name him Toto." Lily pouted. "Can I at least have some ruby slippers?" "Lily! What in the world would you do with ruby slippers? You can't have any." Her mom went into the kitchen to fix supper. Lily ran to her room and cried. She wouldn't eat supper or speak to her mum or dad. All they could hear were her wails about having a Toto of her own. Lily cried herself to sleep. That night she had a very strange dream. She dreamed she was Dorothy and had gone back to the Land of Oz. 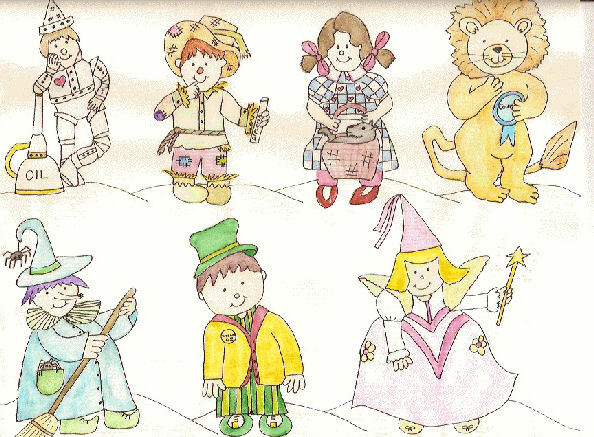 She met the scarecrow, the tin man, the cowardly lion, the Wizard and the good witch, Glenda. They took her to the yellow-brick road and to Munchkinland. Lily was having so much fun. Toto jumped on her and licked her face and she wore ruby slippers. All was going well until wicked witch appeared. She set the scarecrow on fire and took the tin man apart and slapped the cowardly lion right in the nose. When she tried to hurt Dorothy, Lily screamed. She woke up and ran to her mum and dad's bedroom. "Mum, Dad, I had a horrible dream. The wicked witch is after me. Can I sleep in the bed with you tonight?" Her mum and dad rubbed their eyes and yawned. "If you let me sleep with you, I promise not to ask for a dog any more and I won't ask for ruby slippers." Mum and Dad let Lily in bed with them and from then on, not once did she ever ask for either thing again. Sometimes Lily watched the movie, but not as much as she used to. Whenever she put it on, she remembered the strange dream she had and would turn it off and go outside to play.